Cantor Sam Weiss: "Carlebach, Neo-Hasidic Music, and Current Liturgical Practice"
It is a measure of my distraction these years, countered by Sam's patience, that this is finally available. Heavily illustrated and footnoted, a version first appeared in "Journal of Synagogue Music," Vol. 34, Fall 2009, published by The Cantors Assembly. First on the list is last year's long-awaited recording from Adrienne Cooper / Enchanted. I would have reviewed this long ago, but that would have implied that I would put it on the shelf and move on to other CDs that I need to review. No way this CD is unshuffling from the iTunes. Read more, and you'll understand why. I couldn't stop kvelling about the Veretski Pass project, "The Klezmer Shul" back when I first saw it live over a year ago. Now the CD is out and you can hear why. A fusion of klezmer and jazz and avant garde modern music, the arrival of this CD a couple of weeks has pushed almost everything else out of mind. This one CD summation of three monster concerts from a year ago, "Further Definitions of the Days of Awe" is a perfect summation of both the Afro-Semitic Experience's wonderful fusion of Jewish and Black sacred music, and the art of the Cantor as mostly represented by the irrepressible Jack Mendelson, but also including several other significant names. And what better time for High Holiday nusakh than the High Holidays? All last year we got periodic new sounds from "The Nigun Project" by Jeremiah Lockwood, commissioned by the Forward. What is most striking is how much ground Lockwood covers in re-imagining the Nigun while also making deep music. I love this one. I am a year late in my review, but at least I am right in time for the holidays with this return of Steven Greenman's sacred music persona, Stempenyu. This time, he captures "Stempenyu's Neshome". I typeset and laid out the CD, so it can't be all bad—actually, if I were as good a typesetter as Greenman is a violinist, this would be long out of print. Fortunately, you can still get your copy in time for the holidays. Why? Because if there is one thing that will ensure repentence, and get us in the frame to approach the awe of the approaching holidays, it is a reminder of what makes us happy. This loving 2008 re-release of Danny Rubinstein's original 1958 "The Happy People is all that. Come Play Klezmer with Deborah Strauss at the 92nd Street Y, New York City! All instrumentalists (intermediate and above) are invited to join the kapelye (band) led by international klezmer star-fiddler and educator Deborah Strauss. One of the neatest projects to come out of Berkeley's Jewish Music Festival is the Ger Mandolin Orchestra, which has performed at the festival, and this past winter (? spring? ), back in Poland. The project was initiated by a descendent of a member of the original Ger Mandolin Orchestra (a century ago, every town—and many US "Workmen's Circle" groups, had mandolin orchestras), Bay Area resident Avner Yonai. CDs sometimes come in far faster than I can review them. I am going to try to at least get the word out on these with release dates in the coming week, and hope to catch up with reviews as I can. 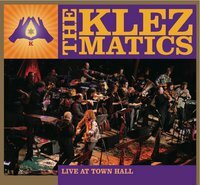 I have already mentioned this new Klezmatics release celebrating their 25th anniversary. The main CD release party is on September 14th in NYC. Let me also repeat that when I first saw the band 15 years or so ago. At that time, as on this CD, the band came out and Lorin launched into a cut off their breakout CD, Jews with Horns, "Man in a Hat." Well, same cut, same energy—or more, and the broadest repertoire of new and traditional Jewish music and Americana played by anyone. You need this CD, and you can get it by doing good: In five days, on September 13th, the Klezmatics either reach their Kickstarter goal of $15,000 to pay for this tour and CD—or they don't. Then what? The band sets up shop as housepainters? That would be bad. Check out the Klezmatics Kickstarter campaign and pledge until it hurts. Make this happen. If, like me, you have noticed that the fiery new violinist in the Klezmer Conservatory Band these last few years also seems to be a favored accompaniest and band-member on other Hankus Netsky projects, you won't be surprised that the classically trained violinist's first CD, Yaeko Miranda Elmaleh features a broad spectrum of underplayed, but very traditional klezmer tunes, ranging from the "Philadelphia Sher" (from whom could you have learned that?) to "Meron" and "Kaddish" (okay, this is Ravel), to some Carlebach tunes and "Waltz from the Hills of Manchuria." The CD release party is this Tuesday, Sep 13, in Boston at Club Passim, one of my favorite venues. Jazzman Roger Davidson explores klezmer with some of my favorite musicians, including Frank London, Josh Horowitz, Khevre graduate and current Klezmatics drummer Richie Barshay, the great Pablo Aslan on bass … and Andy Statman. The territory is relatively familiar, but this is an all-star cast. The CD, On the Road of Life . The release party is September 17th, at Drom, in NYC. The latest edition of my Kosher Jam internet radio show, first broadcast on Tuesday 6th September, can now be listened to anytime at: www.ukjazzradio.com/listenagain.htm. Highlights include: Martial Solal, one of the great jazz pianists, performing live in New York just after the 9/11 terrorist attack; guitarist Michel Sajrawy, a Palestinian from Nazereth, whose albums are collaborations between Palestinian and Israeli Jewish musicians; the late saxophonist Arnie Lawrence, who also strove to bring musicians from these two communities together; and one of the rhythm and blues hits Jerry Leiber, who died last month, co-wrote for the Coasters; and Jewish jazz from Australia. Review of Yale Strom's "Dave Tarras, the King of Klezmer"
I am catching up from a year of overload, it seems. Here is a review of Yale Strom's new book on Dave Tarras—if you look at the KlezmerShack calendar you'll see that Yale is doing some appearances this fall based on the book, so it is still current. Dave Tarras, the King of Klezmer - by Yale Strom : A book review by Michael Sherman, January 2011. Many thanks to author Michael Sherman for bringing this to my attention. The dance they were doing is (as I understand it) the last remnant of the old "Broiges Tanz," once done by the mothers-in-law at a wedding, now done by two guys instead, fighting (*nebech*) over a bottle...death resulting. Followed, of course, by "t'chies hameisim" *(b'ashkenazit)* - the resurrection-of-the-dead dance. It's not specifically a hassidic custom; I've been asked to play it for litvaks, too. We put together a free High Holy Day Music sampler for Amazon. Until Rosh Hashana (Tishrei 1), in honor of Jewels of Elul (www.jewelsofelul.com) you can download all of the songs for free (Alas, Amazon.com limits this to US visitors only). There is an amazingly eclectic mix of music from Josh Nelson, David Broza, Basya Schecter, Alberto Mizrahi and a handful of other artists. This one's totally free, all over the world, and available till after Hoshanah Rabbah! California 2012 Yiddish Festival dates announced - interested in helping? We encourage you to email us to suggest Festival workshops. Here are workshops we offered at our February 2010 Festival in Palo Alto: For all: Jewish Music Beyond Jewish Life, Yiddish Literature in Translation (2010: Yiddish Epitaphs, Monologues), History of Yiddish Language and Literature, Acting, Papercutting, Amulets, Klezmer/Balkan/Roma Connections, 110 Yiddish Words the Average Puerto Rican New Yorker Knows and You Should be Ashamed if You Don't, World of Our Great-Grandparents, Shared Melodic Repertory of the Yiddish and Greek Worlds, Growing Up With Yiddish, Yiddish Words and Expressions for the 21st Century, Yiddish Film. For singers: Yiddish Love Songs, Yiddish Song Rarities, Master Classes, Sing-Alongs. For dancers: Learn Klezmer Dances, How to Lead Klezmer Dance, Dance Parties. For instrumentalists: Master Classes, Ensembles, Make Them Dance, Klezmer Style/Technique: Melody or Accompaniment, Composing and Improvising, and Klezmer Theory. Want the same? Different workshops? Send us your ideas! We have the rare chance to make CD recordings with Arkady Gendler this coming October. Over the last ten years, Arkady has written a number of beautiful new songs. Most of them have not been recorded yet, some have never been performed in public. It is Arkady's wish to still see his original work published and accessible to everyone—he is proudly approaching his 90th birthday this fall. Several of his songs are dedicated to the places and festivals Arkady visited during the last years, songs about Kiev, Vienna, Weimar, his home Zaporozhye and the Dniepr Klezmer Cruise. There is a moving song called "Khaves Tekhter" that he wrote when his wife passed away—it has not been performed yet. I am now writing arrangements for a small chamber ensemble (piano, vl, va, vcl) plus a few additional instruments - it is a total of twelve songs that Arkady wrote (one has a borrowed melody, for another one he created complementary lyrics). We will record all of his original work, plus a few other favourites. And yes, we need funding! While studio costs, tied to successful funding of the entire project, are already secured, we need to raise funds for travel, food & lodging, visa, assistance for Arkady in Vienna, Yiddish documentation, transliteration, translation, the recording musicians, typography and graphic design. This project is supported by a wonderful group of friends, scholars and artists, many of whom are donating their services, or, were they can't, agreed to more than modest financial conditions. And you can help us, too! About a decade ago, Alicia Svigals recorded a pretty amazing CD of Hassidic nigunim under the name of the "Nikolayev Ensemble." In celebration of the decade since the original re-release, JewishLearningGroup.com maven, Zalmen Goldstein did the impossible: He improved upon the original. The cover is differently cheezy, and he has renamed the bass-player known to most of us as "Marty Confurious," but the production is even better. An unrelated first track by a different ensemble is gone. Aaron Alexander's outstanding drumming was added to the tracks. The result, quite frankly, is quite delicious. If you don't have the original, or if you're ready to compare the two, check out "Chassidic Breeze" (now credited to no ensemble until you get to the website where it is, indeed, credited to the much-missed Ms. Svigals). If you already know the recording and need read no review, you can purchase it directly from JewishLearningGroup.com. Rosh Hashanah is coming. This could be the soundtrack! no Jewish music in Istanbul? Au contraire! Alexander Gelfand, a writer that I often admire, has a curious story in this week's Jewish Forward in which he laments the lack of remaining Jewish community in Istanbul. That is true—the Jewish community in Turkey in general, and Istanbul is much diminished. He doesn't mention, but I will, that even the Holocaust had an effect—witness Kurt Waldheim's nasty efforts to help eradicate the Jewish community of Salonica (since the collapse of the Ottoman Empire, part of Greece). But there is so much that is exciting that still remains! I have several as-yet-unreviewed Jewish recordings made in Istanbul in recent years. Notable among those that I have reviewed are a recording by Hadass Pal Yarden (who also seems to perform locally in Istanbul, and internationally), "Yahudije" or this kid's recording reviewed by Professor Judith Cohen in 2006, "Izzet Bana & Estreyikas d'Estambol / Un Kavretiko". In short, although the Jewish community in Istanbul is much diminished, it has not vanished and there are some fascinating places still alive and worth exploring.